Breakfast should never be skipped. 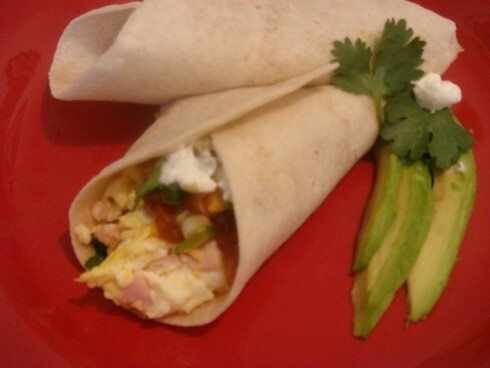 This spicy low-carb egg burrito is a great alternative to the minimally nutritious breakfasts most Americans eat, especially our kids (cereals, donuts, coffee drinks, juice/toast, etc.). 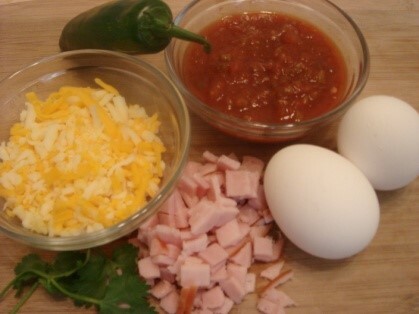 The Spicy Egg Burrito contains approximately 30 grams of proteins, 14 grams of usable carbs, and 14.5 grams of fiber. It is a simple to shop for, easy to make, tasty breakfast that meets your nutritional requirements recipe. Not for the VLCD. Mix chopped bacon with egg mixture. In a heated non-stick pan, add egg/ham mixture and lightly scramble until cooked, 2-3 minutes. Don’t overcook. Turn off heat under pan and let eggs rest. In microwave, heat tortilla on a plate for 10-15 seconds. Remove. Layer cooked egg mixture, cheese, avocado and salsa on the warmed tortilla. Sprinkle green onions, chopped cilantro and sliced jalapenos as desired.